Chinook salmon return to Alsea Bay in small numbers in some years as early as the last week of August but usually during the first week of September. The run peaks in late September to early October running into November. The average catch rate is 2780 fish per year. The best fishing for newly arriving fall Chinook salmon occurs in the lower bay during the incoming tide of the major tidal exchange of spring tides or neap tides especially when the incoming tide coincides with sunrise or sunset. The next most productive fishing period occurs at sunrise or sunset during the incoming tide of the minor tidal exchange in the daily tidal cycle. Daybreak is that magical time of day when Chinook salmon bite the best. Be sure to have the bait in the water one half hour before sunrise. Fishing is most productive from ½ hour before sunrise to midmorning and from late afternoon until ½ hour after sunset. Trolling a plug cut herring with the incoming tide through high slack tide in the lower bay from the bar to the Port Docks is the most productive method to catch early returning fall Chinook salmon. The velocity of the tidal current requires the use of heavy sinkers up to 16 plus ounces to keep the bait in the Chinook’s strike zone. Most anglers concentrate fishing in the upper bay from the Port Docks to the confluence of Drift Creek to avoid the dangerous tidal conditions of the outgoing tide in the lower bay. Chinook salmon move into the upper bay above the Port Docks to avoid the high velocity of the current in the lower bay. The color of the water in Alsea Bay varies from clear to off colored and stained depending on the amount of rainfall runoff especially the runoff from Drift Creek. Fish in the upper bay in the main or north channels from the confluence of Drift Creek to the Port Docks by trolling with or incoming or outgoing tide using a plug cut herring or spinners equipped with genuine silver, matte silver or rainbow colored blades when the water is clearer and spinners with green accents and rainbow colored spinner blades or with 50–50 green or chartreuse hammered brass spinner blades in dingy stained water. Back trolling or back bouncing with a plug cut herring or spinners during the outgoing tide are options that produce fish. Trolling a plug cut herring or spinners on the tidal flats above and between the Port Docks and North Island during a last hour of the incoming tide through high slack tide is an option that can be productive. Remember when buying herring buy the largest herring available. 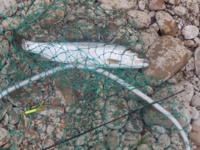 Fish in the lower tidal reach of the river channel from Taylor’s landing to the confluence of Drift Creek or in the tidal reach of Drift Creek using the following baits. Troll with the incoming tide with spinners equipped with genuine silver, matte silver or rainbow colored spinner blade or bait wrapped Flatfish lures with a silver body and chartreuse or green accents. Back bounce or back troll with the outgoing tide fishing with a walnut sized gob of salmon eggs, spinners or with bait wrapped Flatfish lures. Drift with the tidal current using a free sliding bobber to fish a walnut sized gob of salmon eggs topped with a sand shrimp just off of the bottom. Bobber fishing with walnut sized gob of salmon eggs topped with a sand shrimp while drifting with the tidal current is the most popular method used to fish for salmon in the upper tidal reach of the river channel. Anchor above the deeper holes from Taylor’s landing to the head of tidewater above Kozy Kove in the community of Tidewater. Fish with a bobber during the last half of the outgoing tide through low slack tide using a walnut sized gob of salmon eggs topped with a sand shrimp. Fishing with bait sweetened Spin–N–Glos, spinners, spinner bait combinations, bait wrapped Flatfish lures, wobblers or bait while anchored above the deeper holes during an outgoing tide are also productive methods for catching Chinook salmon in the Alsea River. Historic catch statistics represent a window of opportunity for catching the salmonids returning to the Alsea River Basin. Click on Sport Catch Statistics - Salmon, Steelhead and Sturgeon to view the catch statistics for the salmonid species of interest. The reports on this page represent harvest statistics gathered from sports harvest angler tags (punch cards) returned by anglers to ODFW. This sports harvest data has not been verified by ODFW and may be inaccurate for several reasons. Errors may arise from anglers incorrectly reporting locations, dates, and/or species of catches; or from errors in data entry caused by difficult-to-read harvest cards. According to the annual Recreational Coho Catch Statistics the number of hatchery Coho salmon catch rate for Coho returning to the Alsea River vary from 1000 fish in 2015 to 1400 fish in 2013 to a high of 3100 fish in 2014 when returning hatchery Coho were tagged. Coho salmon According to the monthly Coho catch statistics. Coho salmon begin returning to the Alsea River Basin in some years in July but mostly in late August, peaking in September through October before declining in November and some years in early December. Troll a plug cut herring, hoochies or streamer flies behind a diver or wire spreader in the lower bay with the incoming tide in the upper half of the water column from the bar to the Port Docks trolling. Fish in the upper bay from the Port Docks to the confluence with Taylor’s Landing trolling plug cut herring, chartreuse hoochies, streamer flies, rainbow, chartreuse or pink colored spinners. Remember Coho salmon prefer bait trolled at a speed of 3 to 5 knots. Most anglers target Chinook salmon when fishing the lower Alsea River Estuary; however, when retention of hatchery Coho is allowed anglers target both Chinook and Coho salmon in the lower Alsea Bay. 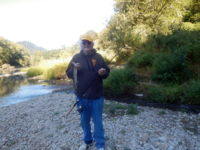 Fishing from the bank of the Alsea River and tributaries east of the Port Docks is limited by private property. There are numerous areas of public property. Pullouts along Hwy 34 often disclose the location to reaches of the river accessible to anglers. Bank Fishing at the entrance to Alsea Bay is under utilized to say the least. Fish along the north shore for perch, starry flounder and salmon from the Highway 101 Bridge seaward and along the south shore for salmon from Interpretative Center seaward and for perch and starry flounder from the Port Docks located in Waldport seaward. Bank Access is limited in the upper bay and the lower tidal reach of the river channel is limited by private property. However in today's environment the chance of catching a perch or starry flounder is remote. Steelhead in the Alsea Basin provides good fishing opportunities for hatchery winter steelhead from December into March. The target release of 120,000 smolts into the Alsea are split between the traditional Alsea hatchery brood stock and wild Alsea brood stock. The data from this study will be used to test for a difference in catch ability or “harvest vulnerability” of steelhead produced from wild parents that were harvested by anglers vs. steelhead produced from wild parents that returned to the hatchery. Harvest will be evaluated with a statistical creel survey, conducted by ODFW surveyors and straying will be assessed by monitoring adult collection sites in the basin. 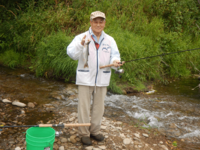 Anglers wishing to participate in the program by contributing wild-caught fish for brood stock to the Alsea hatchery are encouraged to coordinate with the hatchery (Matt Frank, 541-487-7240). Additional information is available by contacting staff at the Mid-Coast District office of ODFW (Derek Wilson, 541-265-8306, ext. 236). The 2012 release of winter steelhead smolts was the second year of a new release point down river. Approximately 40,000 smolts of the traditional hatchery stocks were released near Blackberry Park. This release group will return this winter and should hold up in the lower river longer than in fish in previous years. The Alsea contains a lot of bedrock shelves and deep slots that make side drifting difficult. Popular tactics include pulling plugs or divers with bait, drifting bobbers with bait or jigs, and swinging spoons across riffles. Fair to good bank access can be found throughout most of the basin at numerous public pull offs and parks along the river. 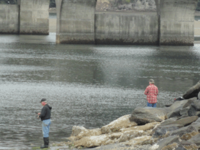 During high water, bank anglers should focus their efforts in the upper basin and around the Alsea Hatchery. A parking lot just below the hatchery provides anglers with off-road parking and access to the river. Most river access near the hatchery is on private property, which is clearly posted. Drift boats can be put in at launches from just downstream of the town of Alsea all the way to the head of tidewater, depending on the time of year and river conditions. Fishing from a floating device is prohibited above Mill Creek. Throughout the season a portion of hatchery steelhead captured at the Alsea hatchery traps are recycled downstream as far as the Blackberry Launch to provide additional fishing opportunity. Drift Creek-Alsea offers fair to good catch-and-release wild steelhead fishing. A large portion of the river is within the Drift Creek Wilderness Area providing good hike-in opportunities in a remote, old-growth setting. Cutthroat trout return to the Alsea River early in July and run through August. Fish from the first week of July through the first week of August trolling Doc Shelton spinners rigged with night crawlers from Eckman Slough upstream to Canal Creek. Troll with Doc Shelton spinners rigged with night crawlers or cast spinners in the upper tidal reach of the Alsea River above the community of Tidewater through the end of August. Sea run cutthroat trout my favorite fishery! Nothing in nature matches sunrise on a river bank, pond or lake The anticipation is overwhelming. Pileperch, walleye surfperch, redtail surfperch, white seaperch and striped seaperch enter the bay in late spring. Striped perch are the dominant perch species found in the bay. Schools of perch move onto the tidal flats feeding heavily on intertidal animals upstream from the entrance to the bay to McKinney’s Slough. The fishing ranges from fair to excellent through fall depending on the tides and the weather conditions. Fish for perch in the channel adjacent to the Port of Alsea, at the entrance to Lint Slough and along the channels that drains the tidal flats of northern half of the bay to McKinney’s Slough. Starry Flounder fishing ranges from nonexistent for most of the year to fair in the spring. The best fishing occurs from the Highway 101 Bridge to the North Channel that drains the tidal flats of the upper bay. White sturgeon enter Alsea Bay in small numbers for most of the year. The best fishing occurs from May through August. Fish in the holes downstream from McKinney's Slough and Eckman Slough or from the confluence of Drift Creek upstream to Taylor’s landing. The best time to fish for sturgeon is two hours before low tide. Mud and sand shrimp are the most productive bait. The sturgeon fishery is a small one ranking 6th overall when compared to more productive bays averaging 45 fish per year with low and high yearly catch of 12 and 116 fish respectively. Tidal Projections:View the tidal projections for Waldport, or view the tidal projections for Drift Creek. Fish and Shellfish Consumption Advisories and Guidelines Softshell clam advisory for Oregon Coast. The CDAO does not recommend consuming contaminated clams or fish species of any species. However the purple varnish clams in Alsea Bay like the estuaries that are monitored should be free of contamination from arsenic; and the clams have not been contaminated by Domoic Acid or PSP that have closed the Oregon Coast to the taking of razor clams and mussels.